Les Miles leads Tigers onto field. JaMarcus Russell looks for a receiver. Melvin Oliver takes aim at D. J. Shockley. Skyler Green eludes Kelin Johnson on kickoff return. DeMario Minter celebrates his INT. 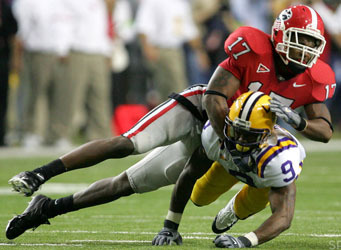 Chevis Jackson tackles Danny Ware. Mohammed Massaquoi takes flare pass as Jonathan Zenon chases. Jackson grabs D. J. Shockley as Cameron Vaughn gives supports. Kregg Lumpkin turns the corner. Bailey makes his second TD catch of Q1. Bulldogs congratulate Bailey on his 2nd TD catch. Tim Jennings and Greg Blue converge on Dwayne Bowe. Joseph Addai avoids Jarvis Jackson. Rudy Niswanger prepares to snap. Prude tackles Thomas Brown just before LaRon Landry hits late. Landry grabs Brown's face mask for his second consecutive 15y penalty. Steltz bulldogs TE Leonard Pope. Jennings scores on INT return. Bowe catches Q4 TD pass. 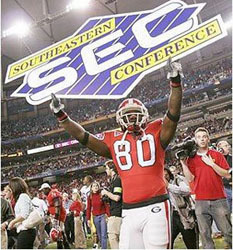 The Georgia Bulldogs were not expected to make the SEC Championship Game at the beginning of the 2005 season. Sportswriters put the Preseason Favorite hat on Tennessee and voted Florida under new coach Urban Meyer ahead of the Bulldogs in the East. 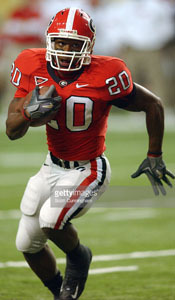 But Mark Richt's fifth UGa squad started strong with a 48-13 thumping of Boise State at home, the first of seven straight triumphs that included a 27-14 spanking of #8 Tennessee in Neyland Stadium. 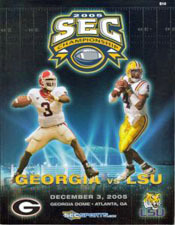 Then came stumbles against the Gators 14-10 in the annual clash in Jacksonville and Auburn 31-30 in Sanford Stadium. But a 45-13 victory over Kentucky clinched the SEC East. The Bulldogs capped a 9-2 season with a 14-7 win over archrival Georgia Tech. 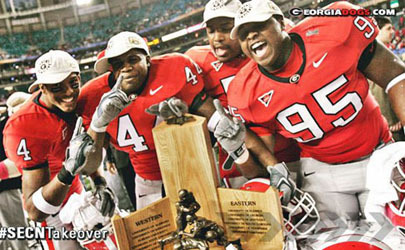 Still, some writers felt the #13 Bulldogs won the division only because the East was the weakest it had ever been. In fact, the Dogs would not have made it to Atlanta had not Steve Spurrier, in his first year coaching South Carolina, upset his alma mater, Florida, November 12. The Tigers were the undisputed Cinderella story of the SEC. No, not because they were not considered a solid team. To the contrary, the league scribes pegged LSU as the West favorite despite Nick Saban's departure to the NFL. But nature intervened in the form of hurricanes Katrina and Rita. The result was three rescheduled games and a disrupted September on a campus choked with evacuees. For weeks, helicopters brought victims to the Maravich Assembly Center which had become a triage center. No better example could be cited for the players' disrupted lives than the starting QB. 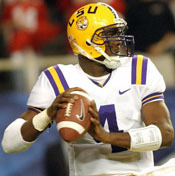 Thomas Stinson told the story in the Atlanta Journal-Constitution: As New Orleans began to empty before the hurricane, JaMarcus Russell's apartment began to fill. Five and then 10 evacuated family members and friends showed up at the ... QB's place, just a few blocks off campus ... Then a dozen, and still more came. Russell's door opened one day and there stood Fats Domino, his girlfriends' grandfather but now just another 9th Ward evacuee some had feared dead. It was, like, normal," Russell said. "He actually just wanted to sleep on the couch." The final occupancy count reached 22 ... "It was kind of hard walking around," he said. 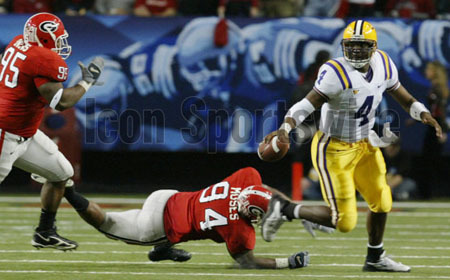 When the Tigers blew a 24-7 Q3 lead to lose to Tennessee in OT in Game 2, they dropped out of the Top Ten. But they refused to lose the rest of the season, including two more OT games against Auburn and Alabama. After playing 12 games in 12 weeks, the Tigers finished #3 in the AP poll and #4 in the BCS Standings. 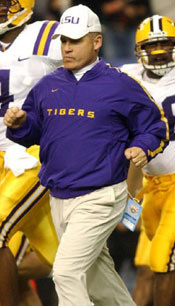 LSU tied Auburn for first place in the West, but Les Miles became the first coach in SEC history to lead his team to the championship game in his first year at the helm because of the victory over the Plainsmen in Baton Rouge October 22 - a game in which the visitors' preseason all-SEC kicker missed five FGs. Miles's crew still had a slim hope of competing in the BCS championship game if UCLA could upset #1 USC and Colorado upended #2 Texas in the Big 12 Championship Game. 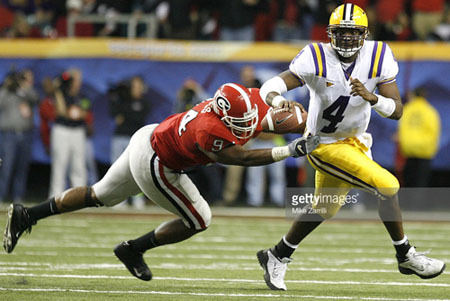 But slim would drop to zero if LSU failed to take care of business in the Georgia Dome. If any team had proven it could overcome distractions, it was the 2005 Tigers. Miles: I don't know that this can be accurately described ... what happened to these young men. This team's focus has been tested, certainly at the onset of the season and throughout the season. DT Kyle Williams: Through it all, we came together and learned to rely on one another. With all that we've faced, and some of our guys have had to deal with missing family members, we've drawn closer together and become one big family. 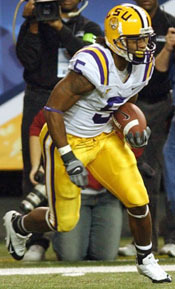 The consensus pick was the Tigers to win their third SEC title in five years with their eleventh straight victory in a domed stadium, including four in the Georgia Dome. Both teams boasted good QBs, multiple RBs, and top-notch defenses. D. J. Shockley and JaMarcus Russell ranked 1-2 in the conference in pass efficiency. Russell possessed a powerful arm and could throw well on the run. But Shockley, a fifth-year senior who waited his turn behind David Greene, could scald a defense with his feet. D. J. 's absence contributed to the loss against Florida. 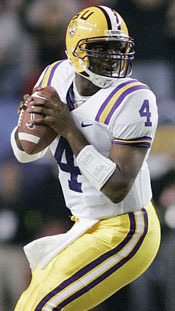 He was undoubtedly the most talented dual threat QB the Tigers had faced all season. Randy Rosetta of the Baton Rouge Advocate penned one of the best predictions. This game will come down to which QB makes better decisions and bigger plays against very stout defenses. LSU deployed one of the nation's best run defenses. Auburn was the only opponent to top 100y. Bo Pelini's D unit had not allowed a Q1 TD in their last eight games. The Bengals also ranked second in the SEC with 33 sacks. Comparative scores produced conflicting results. 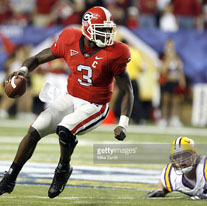 Georgia beat Tennessee which beat LSU. 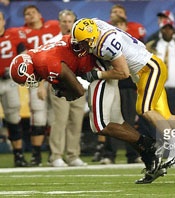 But LSU downed Auburn which upended Georgia. One statistic strongly favored UGa. 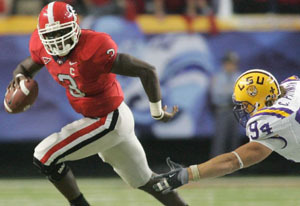 The Dogs ranked 9th in the nation in turnover margin while LSU lagged at 98th. Also, the Tigers ranked 107th in kickoff returns. The two marks combined indicated Georgia might enjoy good field position. Two of the nation's more dangerous punt returners would try to make an impact on the game - LSU's Skyler Green and Thomas Flowers. Winner of 43 of his last 51 games and 1-1 in his two previous SEC Championship Games, Richt used his team's underdog status to motivate them. Most everyone is picking LSU to win and to go to the Sugar Bowl. But when people don't think you can do something, you like proving them wrong. The coach didn't say it, but his club wanted revenge for their 34-13 loss to LSU in the title game two years earlier. And the Bulldogs enjoyed a home-field advantage of sorts just 70 miles from home. 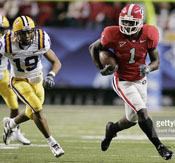 Georgia D-coordinator Willie Martinez made his defense watch video of the Bulldogs' embarrassing 34-13 loss to LSU in the 2003 SEC Championship game. They watched Justin Vincent's 87y TD run to get the ball rolling in Q1. They also watched Michael Clayton's 43y TD catch. 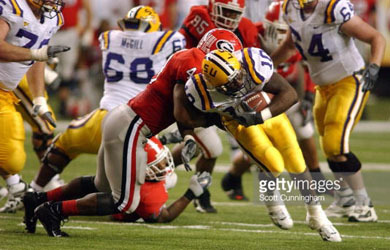 DE Quentin Moses explained: We knew what LSU did to us in the past in the SEC Championship. Our whole goal was to not let what happened two years ago happen again. DB DeMario Minter sounded a similar theme as his coach. I think this team kind of liked flying under the radar. There wasn't too much attention on us, not a lot of pressure on us, so we just came out of nowhere and surprised a lot of folks. 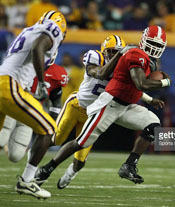 The game matched the two teams with the best records in the SEC since the turn of the century: Georgia 59-16, LSU 58-17. The Bulldogs took control right away. Q1: LSU won the toss and deferred. The Tigers nearly got a break on the opening kickoff when Ramarcus Brown returned the ball but fumbled when popped by Daniel Francis. However, Brown grabbed the ball from under Jason Spadoni on the 26. 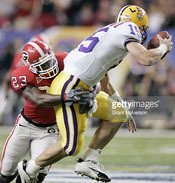 The Bulldogs couldn't overcome Claude Wroten's tackle of Thomas Brown for a 4y loss on second down. An incompletion brought on Gordon Ely-Kelso to punt. Avoiding Skyler Green, he kicked out on the LSU 22. 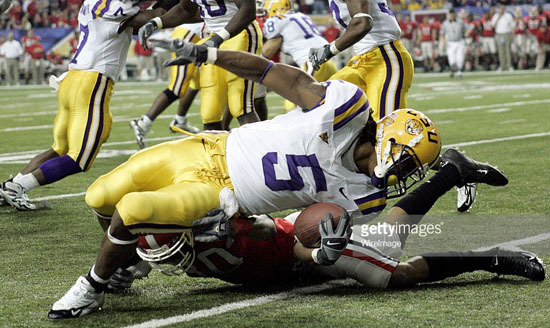 LSU went backwards from there. The Tigers wanted to go deep on the first snap, but Will Thompson burst past RT Brian Johnson to drop Russell for a loss of 14. On 4th-and-23 Chris Jackson punted 38y to , Thomas Flowers, the leading SEC punt returner, who was downed on the 45. Sean Bailey catches his first TD pass as Craig Steltz comes over too late. Shockley explained the TD afterwards: It was a straight go route. Sean read it off the line, and the man coverage. With our receivers, when they have man coverage, they'll come down with it, and Sean ran by the guy and made a great play. The Tigers started briskly from their 20 when Russell rolled right and hit Early Doucet for 6y. On the next play, Justin Vincent took a toss sweep around RE as he did for a 87y Q1 TD two years earlier. But LB Jarvis Jackson shot through and pulled him down from behind for a 3y loss. Then LCB DeMario Minter intercepted Russell's pass on the UGA 49 to put the Dogs right back in business. Shockley: Their DBs kind of knew some of our routes, and I think we used that to our advantage. They bit on the pump fake, and Sean made another great catch. Needing to answer, the Tiger offense did so with a 14-play, 80y drive to pay dirt. 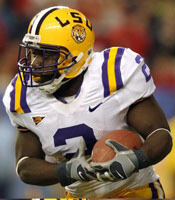 With Joseph Addai on the sideline with an injured ankle, 5'6" Shyrone Carey ran twice for 10y and LSU's second first down of the game. Then Russell found his favorite receiver, Dwayne Bowe, on a down and out for 12 to the 42. Bowe fumbled as he fought for extra yardage, but it was ruled his forward progress had been stopped first. After Carey gained 3, Green lined up in shotgun with Russell at WR and carried around RE for 9. Addai entered and went in motion but was hit as he received a pass. 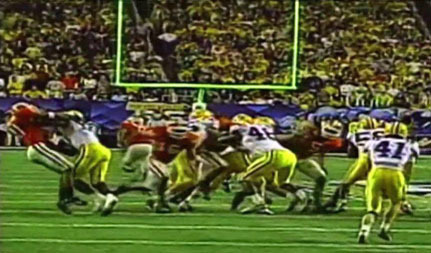 Next, a holding penalty nullified an incompletion and gave LSU another 1st down on the 36. On 3rd-and-3, Addai got a good block to give JaMarcus time to find Bowe in the middle of the field to the 13. The period ended two plays later with LSU facing 3rd-and-3 from the 6. L: Addai can't get free. R: Greg Blue defends Early Doucet. 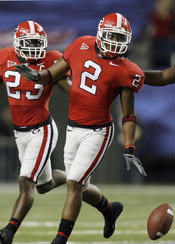 The Tigers stopped UGA's two-TD streak, although the Dogs gained a 1st down on two runs by Brown. But with Pelini calling three straight blitzes, two incompletions and LB E. J. Kuale's sack of Shockley forced a punt which Green fair caught on the LSU 40. The Tigers could do nothing with the good field position, losing 5y on three snaps. To make matters worse, Doucet sprained his ankle leaping for an errant pass and would not return. That set up the turning point of the game. Bryan McClendon broke through untouched from RE when the blocker was lured outside by the gunner who came rushing in from the outside. Bryan dove and got the ball just as it hit Jackson's foot. Chris picked up the ball but was tackled back at the 15. It was the first block of his career. 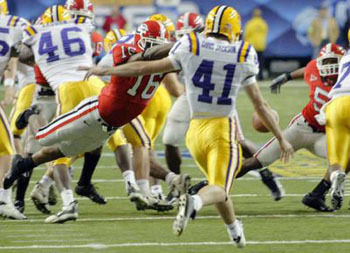 Bryan McClendon (16) roars through as LSU blocker takes on Ramarcus Brown. McClendon: We worked on that play all week. Coach (Jon) Fabris did a great job of scouting, and he drew it up perfectly and called it at the right time. I had blocked a punt against Georgia Tech two years ago on a very similar play. I was happy I could help turn momentum in such a big game. The play was actually designed for DB Ramarcus Brown to block the kick. Brown's responsibility on punt returns was to run downfield and block the opposing team's gunner, who is usually lined up against the sideline. 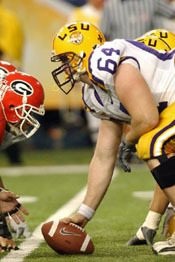 But as LSU began the snap count, Ramarcus started to cheat in toward the line of scrimmage. By the time the ball was snapped, he was halfway to the end and running full speed. Faced with two rushers coming at him, the WB on the left side of the punt team made a quick decision to block Brown. McClendon: Ramarcus came in, and that left me free. My eyes got real big, and I just went in there and jumped on his leg. Fabris: Ramarcus was supposed to block it. But like a lot of plays in football, it didn't work out that way. ... Two things you can get from the kicking game are field position and momentum. That play got us both. Shockley breaks free for Georgia's third TD. Shockley: It was a rollout to the right, and everything seemed kind of jumbled up ... I was able to go back left and get in the end zone. 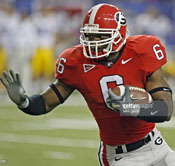 Russell & Company gained a 1st down on a connection to TE David Jones in the soft middle of the defense for 26 to the UGA 49. 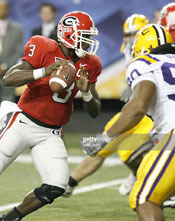 But after several steps forward, the Tigers took one backward when Marcus Howard sacked Russell for a loss of 10 after the QB held on to the ball too long. But the 6'6" signal-caller overcame that mistake with consecutive completions to Bowe for 10 and Craig Davis for 12 to make it 1st-and-10 at the 37. But that momentum was soon squandered. Addai gained 6 but a personal foul penalty on Rudy Niswanger for an obvious late hit made it 2nd-and-18. This time, the offense couldn't overcome the setback, and Jackson punted 34y to the 13. With no room to allow even a FG before intermission, the Tigers surrendered two 1st downs but finally corraled a scrambling Shockley for a gain of only 1 on a 3rd-and-6 at the UGA 42. Continuing Georgia's special teams dominance, Ely-Kelso boomed a 54-yarder to the 3 with 34 seconds left. Fortunately, the Bulldogs had no more timeouts. If the Tigers made any major adjustments, they didn't turn the tide in the second half. Q3: Anxious to get back in the game with an opening drive, the Tigers instead went 3-and-out. LB Quentin Moses hurried Russell's 3rd down pass to Bennie Brazell. Kelin Johnson pulls down Skyler Green on kickoff return. Starting from the 11 after Green unwisely tried to run the kick out of the EZ, the Tigers ripped off three first downs. Vincent got the first one on two 5y runs. Russell moved the chains on a 6y QB draw on 3rd down and the third on the next play when he hit Bowe for 13 to the 34. Then came heartbreak. 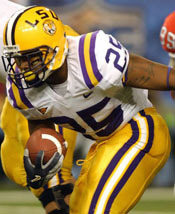 Tiger fans rose to their feet when Russell ran right out of the pocket and threw deep to Brazell for an apparent TD. But a holding penalty on the usually reliable Niswanger negated the play. It was the eighth penalty on LSU. Two errant passes and a sack made it 4th-and-32 and left Russell on the ground injured after Jeff Owens and Moses fell on him. A separated shoulder finished JaMarcus's day (and, as it turned out, his season). When play resumed, Jackson boomed a 48y punt to the 27. Jeff Owens rushes in to help tackle Russell. The Dogs again ground out a time-consuming drive for another FG. Shockley converted a 3rd-and-6 with a 7y WR screen to Massaquoi. Two snaps later, D. J. found 6'7" 250lb TE Leonard Pope for 17y to the LSU 45. Two Lumpkin runs moved the chains again to the 33. The INT provided sweet revenge for Jennings. 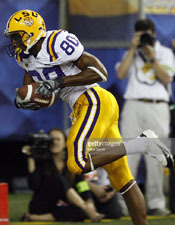 He was the DB burned by Matt Mauck and Skyler Green on the game-winning TD pass in LSU's 17-10 regular season victory in Tiger Stadium in 2003. I knew he was the backup QB, and he really didn't have a feel for the game yet. On his first pass, I saw he took a three-step drop. On the second pass, we were in a three-deep coverage, and I really wanted to slow my back-pedal down, and I knew it was going to be a quick throw. I wanted to bait him, and I just capitalized on his mistake. A meandering Skyler Green wildcat run gained 17 and a 1st down at the 41. But two incompletions and a sack put Jackson to work again. With the sacks factored in, LSU had gained only 36y on the ground. Georgia ran three times and punted. Starting from the 21 and facing numerous reserves, Flynn drove the Tigers to a face-saving TD. Carey ran twice for 8 and 14. 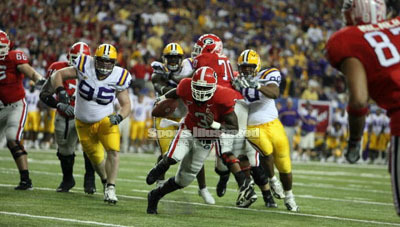 Then Matt kept the ball on a straight run and scurried to the UGA 43. Two plays later, Flynn showed elusiveness when he ran out of the collapsing pocket to the 31 for another 1st. A swing pass to Carey gained 12. On 3rd-and-10, Flynn fired to Bowe behind the defender in front of the goal post. 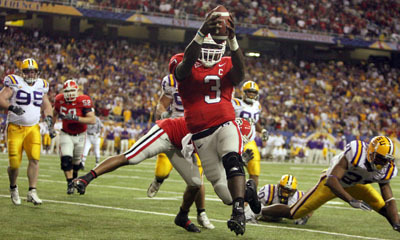 Georgia 34 LSU 14 (5:38) The score was one point different from LSU's 34-13 triumph on the same field two years earlier. Green recovered the onside kick on the LSU 46 for the first big play for the Tigers' special teams. But LSU went nowhere. After three incompletions and a sack - the first time in eight tries the Tigers had been stopped on 4th down, the Bulldogs took over on the LSU 34. Brown gained 18 to the 11. But with the Dogs running the ball every play, the Tiger D, playing with pride, held on 4th down at the 4. Vincent ran for 7 as the clock mercifully reached 0:00. Georgia won the ground war 138-74. However, the total offense numbers weren't far apart: 250-230 in favor of the Dogs. Illustrating the adage "statistics are for losers," LSU ran 66 plays, 12 more than the victors, and had more first downs, 18-16. The Bengals also enjoyed a slight edge in time of possession, 31:11-28:49. Miles had to defend his decision to travel to Dallas Thursday night with AD Skip Bertman to lobby the Cotton Bowl to pick the Tigers if they won the SEC. We have 21 seniors who deserve a great bowl experience, a great group of guys. I took the night away from my family and went. I promise you I would do it again. It has nothing to do with the game plan, nothing to do with expectations. We certainly came here with the idea that we would win. After admitting his team didn't play the type of football that got them to the title game, Les praised the Bulldogs. I think they played well. I think they came in and played the game they were supposed to play. Offensive coordinator Jimbo Fisher on his QB: He did some good things under some pressure, made some plays. We should've made a few more plays. We were just a step short. We had our chances to make plays, and we didn't. They had chances to make plays, and they did. On the Bulldog D: They played well and got off blocks and played a step faster than us. We couldn't get it going with any consistency, and when you become one-dimensional, it's real tough. Russell issued a written statement: We got off to a slow start. Georgia played well, and they got some breaks when we had our touchdown called back. We had to fight to come back, and some bad things happened. C Niswanger took most of the blame for the O-line's struggles. We had some problems and miscommunications as far as what play we were supposed to be running. We had some miscommunications on the line in checks, and it turned out badly for us. Whitworth on the Tigers' inability to run the ball: I think it was something that we were confident about coming into the game. I thought we had a good plan, and all of us believed in the plan but didn't execute it. We didn't finish it off. The big key, we talked about, is finishing things. It didn't seem to happen for us tonight. Green: The offense came out ready to play, but Georgia came out more ready to play, and they played better than us. They did everything well on both sides of the ball, and we struggled to do anything well. They had a great defensive scheme. They knew how to attack our offense. Their front four did a good job putting pressure on our QB, and we couldn't get anything going like we wanted. 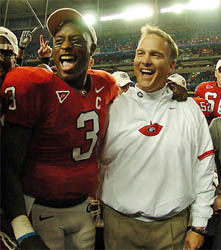 Richt on his team: They have been the most fun bunch to coach. During our two-game losing streak, they never faltered or pointed fingers at each other and just worked through it. They kept working toward being a better football team during that period of time. Their hard work put us in the position to be in the championship game. On his team's fast start and the blocked punt: Championship games are usually built on momentum. And if you get it early, you've got a really good chance. It's just so hard to get it back because everything is so exaggerated in these games. 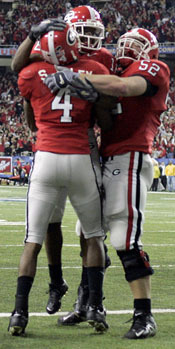 It was the 12th blocked punt in Mark's five-year tenure in Athens. Shockley, the game's MVP, had waited five years for this. It was a special thrill to have a chance to play, to play well and help my team win. The feeling is indescribable. You know, tonight was a true test of what Georgia meant to me. Over the last three, four years, there's always that frustration because you want to play. Any kind of competitor wants to play. But it was all worth it tonight. ... We talked about starting fast, and we were able to do that. I think it kind of carried over the whole game. ... Those were two big-time plays Bailey made to start us off. I don't want to take anything away from LSU's defense, but we did what we talked about doing. The sugar is flowing now. Lumpkin: Nobody thought we would win this game. Our coaches had faith in us, our fans had faith in us, and we had faith in ourselves. Hopefully, this momentum will carry over to the Sugar Bowl with us. D-coordinator Martinez said the plan was to stuff the Tigers' running game and focus on pressuring Russell. In big ballgames, you've got to win the line of scrimmage. We eventually went to a four-down line. We didn't want them to run. We had to make them one-dimensional. DB Minter: I love my D-line, man. A lot of our plays couldn't have been made without them. They made my job a whole lot easier. Jennings: As a defense, we didn't want to give upo the big play. 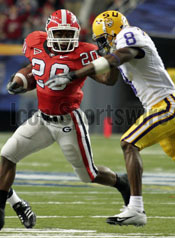 We always had a chip on our shoulder against LSU. As a senior, it was good to go out with a championship. 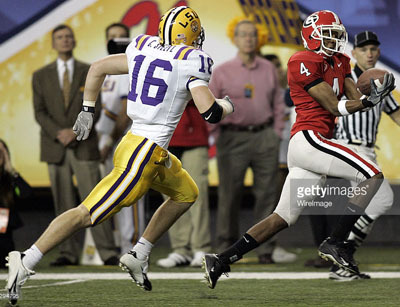 Both teams would return to the Georgia Dome for their final games - Georgia in the transplanted Sugar Bowl against West Virginia and LSU against Miami in the Peach Bowl.